As expected Google dropped in a brand-new laptop during its Google Pixel 2 event on October 4 in San Francisco. It’s called the Google Pixelbook, and as the rumors had it, it's not cheap. But, why is this new device so exciting? Isn’t it just another Chromebook? 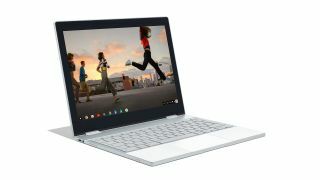 The fact is, this is Google's first self-made Chrome OS device since it discontinued the Chromebook Pixel last summer. It's also the first Chromebook to offer full Google Play Store support for all mobile apps, and it works beautifully with an optional stylus accessory. So, without further ado, here’s everything you need to know about the Google Pixelbook – and be sure to check out our hands-on Google Pixelbook review. While pre-orders for the Pixelbook opened today, units won't begin shipping until November 15. If you we're expecting those traditionally affordable Chromebook prices for the Pixelbook, prepare to be disappointed in this aspect also. The Pixelbook starts at a whopping $999, or £1,199, making it as expensive as an Apple MacBook or Microsoft Surface Laptop. Google is calling its latest Chrome OS product a high-performance Chromebook, and the specs back it up. At this price point you're getting a 7th generation Intel Core i5-powered model complete with 128GB of SSD storage. At its highest configuration, the Pixelbook rings up for $1,649, or £1,699, for an Intel Core i7 model with 512GB of SSD storage. Oh, and if you want the Pixelbook Pen, the stylus costs extra at $99, or £99. With a name like Pixelbook – and the many leaked images we saw – we expected Google's flagship Chromebook would take design cues from its flagship phones. Sure enough, the Pixelbook has the same two-tone, glass-on-aluminum look of the Pixel 2 and Pixel 2 XL. Aesthetics aside, this is among the thinnest Chromebooks on the market measuring in at 10.3mm and weighing just 1.1 kilograms. Google also claims to have surpassed the traditional convertible laptop design with a 4-in-1 product. But, let's be real, it orients in all the same tablet, stand, tent and laptop modes of any hybrid laptop. Like the Chromebook Pixels before it, the Pixelbook features a 3:2 aspect ratio display, though, the screen is a little bit smaller at only 12.3-inches. The good news is that screen can now rotate a full 360-degrees, so you can use the Pixelbook as either a laptop or a tablet. The latest Google Pixelbook houses more storage than any Chromebook from the company before, much less any Chrome OS device ever – period. Specifically, the Pixelbook will come in three varieties: with either 128GB, 256GB or 512GB of flash storage inside. That base model of the Pixelbook offers twice as much flash storage as the previous Chromebook Pixel. The Pixelbook also comes with equally beefy Kaby Lake Intel Core i5 and Core i7 processors. These aren't quad-core CPUs you'll find the Intel's latest 8th-generation Kaby Lake Refresh line, but they should offer more than enough power to drive your Android apps. Speaking of apps, the Google Pixelbook is the first Chromebook with full access to all the Android apps in the Google Play Store. That's right, you can finally use any Android app on the Pixelbook. What's more, Google Assistant comes baked into the Pixelbook, making typing things into your browser window almost seem antiquated. Users can summon the search company's virtual assistant simply by saying "OK Google," Alternatively, the keyboard also has a dedicated Google Assistant key on the bottom row. Lastly, the optional Pixelbook Pen aims to bring the device on par with other 2-in-1 tablets like the Surface Pro and iPad Pro. The stylus supports 60-degrees of angular awareness, 2,000 levels of pressure sensitivity and only 10 milliseconds of latency. If the Pixelbook Pen is as good as it sounds, it might even 1up the Samsung Chromebook Pro. What will be the fate of the best Chromebooks?